Dennis Carr is the Carolyn and Peter Lynch Curator of American Decorative Arts and Sculpture in Art of the Americas at the Museum of Fine Arts, Boston. He was a co-curator of the MFA’s 53-gallery Art of the Americas Wing, which opened in 2010, and he works closely with the American, Latin American, Ancient American, and Native American collections at the museum. His recent exhibitions include Made in the Americas: The New World Discovers Asia (2015), Collecting Stories: Native American Art (2018), and Cecilia Vicuña: Disappeared Quipu (2018), and he contributed to Art and Industry in Early America: Rhode Island Furniture, 1650–1830 (2016), which won the Charles F. Montgomery Book Prize and the Historic New England Book Prize. He holds graduate degrees from Yale University in the History of Art and from the Winterthur Program in Early American Culture. Prior to joining the MFA in 2007, Carr served in the departments of American Paintings and Sculpture and American Decorative Arts at the Yale University Art Gallery. 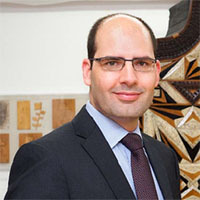 Carr is currently at work on Royal Houses of the Eagle: Aztec and Habsburg Empires, which explores the idea of collecting from a cross-cultural perspective in the sixteenth century.